Power: 450mah. Portable and easy to use! CloudV Jet vaporizer will soon become your favorite liquid essential oil vape. It features a strong 450mAh battery with preheat option and 3 voltage settings and a liquid cartridge free of cotton and wicks. 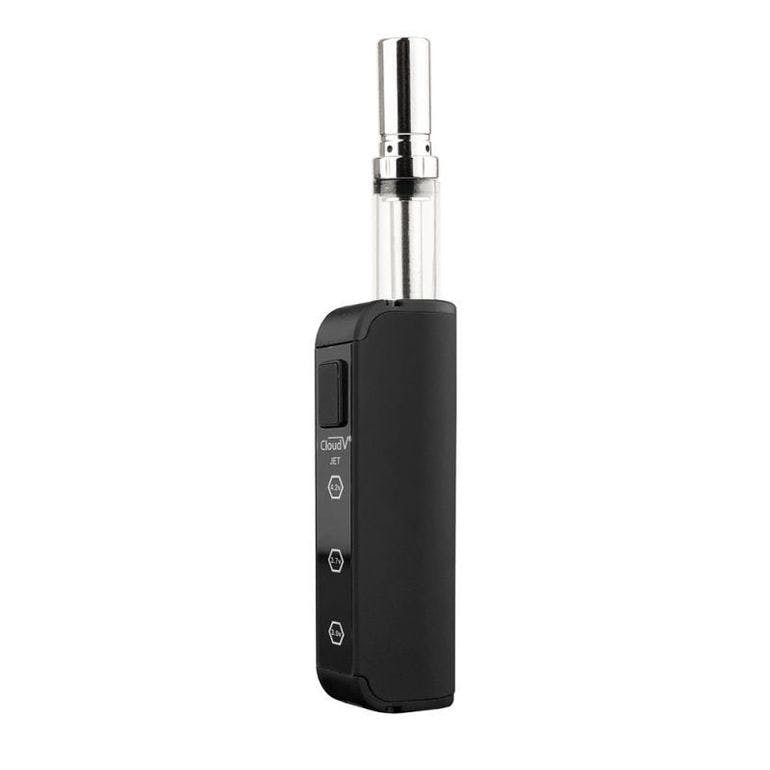 Jet kit includes:1 Liquid Atomizer, 1 450mAh Battery, 1 USB Charger, 1 Magnetic Connector. Jet Dimensions:0.6" x 0.9" x 3.7" Voltage Settings are: Green - 3.0V, Blue - 3.7V, Red - 4.2V. How does the CloudV Jet work? Once unpackaged, your CloudV Jet Vaporizer will be locked. To unlock it, you should press the button 5 times in sequence. It will blink to indicate that it is unlocked. For the highest performance, you should charge your Cloud no longer than 1 hour for full charge before use.You can change the voltage settings by pressing the button 3 times in sequence. To use the preheat option, press the button 2 times in sequence. Use the preheat option when you are using thick essential oils. This will liquify the oil and make it easier to be vaporized. How does the CloudV Slim charge? Connect the USB cable to the charging port. Insert the USB Charger into the charging device. Remove the battery when the red LED light turns off. Do not overload the atomizer. It is suggested to fill 2/3 of the volume for the best performance. Make sure your battery is locked after use to avoid activation. This vaporizer is not intended for concentrates or ground products. WarrantyCloud V Enterprises warrants CloudV Jet Battery against defects in materials and workmanship under normal use for a period of 6 months from the date of retail purchase by the original end-user/purchaser. If physical defect arises and a claim is received within the warranty period, Cloud V will either repair the product defect or exchange the product with a new or fully functional one.The limited warranty does not apply to normal performance degradation of batteries or neglecting to adhere to cleaning instructions. The limited warranty does not apply if the product is used with non Cloud certified or approved products, used for commercial purposes, damaged by wear and tear, acts of God, misuse, abuse, negligence, accident, modified or tampered with, or any other cause other than defects prior to loading your material. Cartridges and accessories are not covered under warranty.CautionsWhen not in use, you should store your Cloud in a safe place to avoid accidental activation. You should not leave your charger plugged in or unattended in a hot area or near flammable objects as this could be a fire hazard. You should keep your Cloud away from water or any other liquid and away from any environment involving strong acids, alkaline or combustible material. Please keep this out of reach of children and pets. More info at: https://cloudvapes.com/vaporizers/liquid/jet-vaporizer. SpeedyTree is an authorized CloudV Distributor.